"The difference between resistors running in parallel and in series; and the Kirchhoff junction rule saying that for currents, what goes in must come out." "In addition to stacking resistors, they can also be wired in parallel so as to receive the same amount of voltage each as the original source. 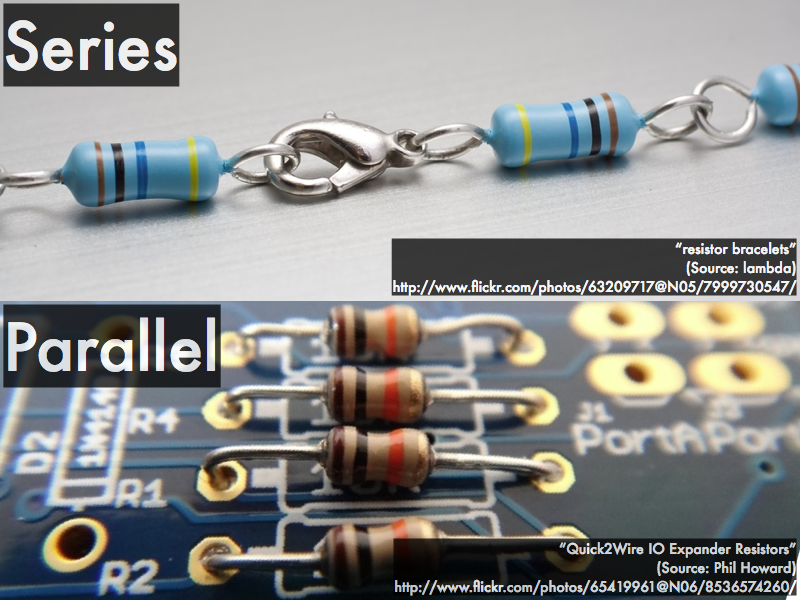 To add resistors in parallel, add together the inverse value of each resistor." "That a series is where resistors are arranged so that a current may travel through them in a sequence. I also understand that a parallel circuit is arranged so that a current can travel through multiple resistors at once." "That in a junction, charge going in equals charge going out. For a loop, the sum of voltage changes rising equals the sum of voltage changes dropping. 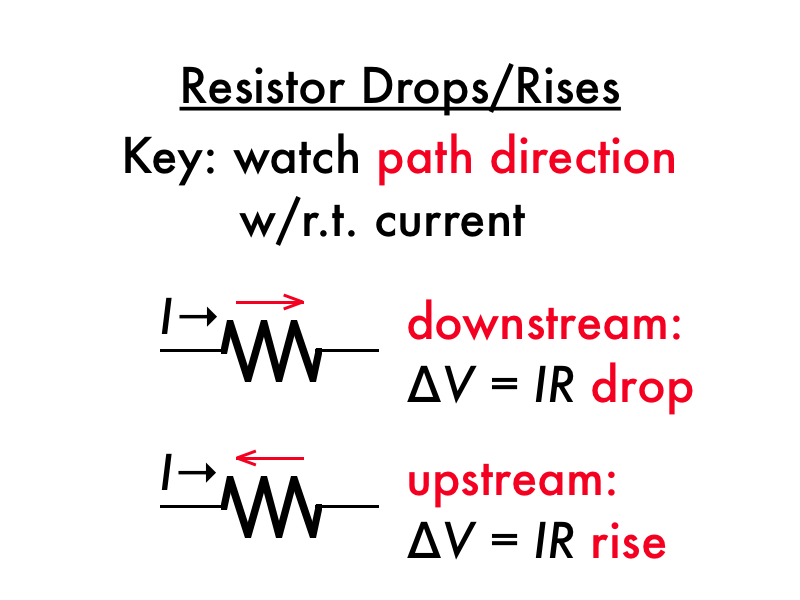 Equivalent resistances in a series is merely the sum of each resistor whereas parallel resistors require the addition of the inverse values of each resistor added and then the sum is inversed." "The sign (+ or -) determine if we are gaining or losing electric potential. Potential increases if going from - to + but decreases if we go from + to -." "Whatever flows into something must come back out. Current leaving a junction must add up to what entered it." "Determining what happens to current and voltage through an ideal wire." "The loop rule seems tedious." "I don't really understand why voltage potential difference drops and electric potential will decrease when the circuit is moving from positive to negative. I also don't understand why voltage potential difference and electric potential will increase when the circuit is moving from negative to positive. I really just don't get why it changes in the first place." "I'd like clarification on the loop rule. 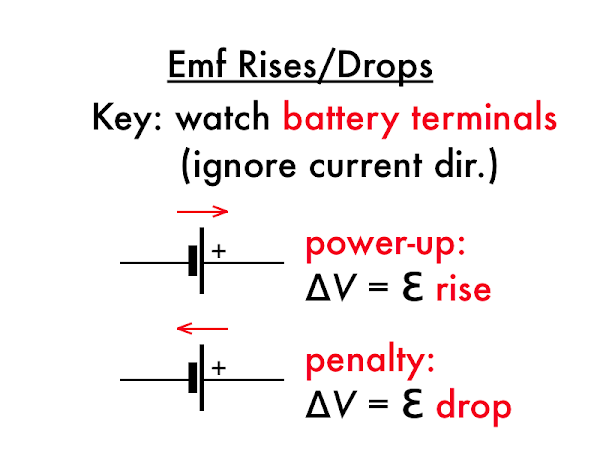 I understand rise in voltage must equal drop in voltage, but I am having trouble conceptualizing the process." 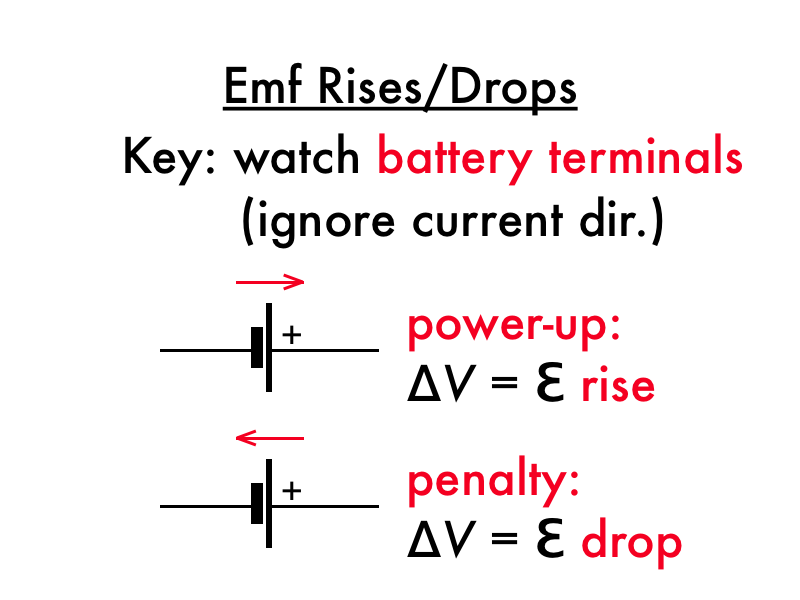 "emf rise and drops and how to determine if the current or voltage goes up and down." "I don't get why Benjamin Franklin didn't have the current flow follow the electrons it would be way simpler then! Otherwise the concepts don't seem too confusing." "This didn't have anything that seems confusing." "The assigned textbook reading was not really confusing but I am definitely looking forward to do some practice in class." "When applying the Kirchhoff's junction rule the current (amperage) is conserved." "The sum of the current leaving the ideal battery is the same as the current entering the ideal battery." "When applying the Kirchhoff's loop rule the electric potential is conserved. The initial voltage drops through all the components of the circuit." "Electric potential energy because energy can not be lost or gain through any means in a closed system." "Electric potential energy per charge." "The sum of all voltages must be equal to zero in a closed system." "Please go over Kirchhoff's rules and the examples above."